California is a solar giant. Well, it’s a giant in general. It’s the most populous state in the United States, home to 1 out of every 8 Americans. Also, the state has a larger economy than all but 8 countries (US included). Being quite progressive, it’s a given that California would be a solar energy leader. 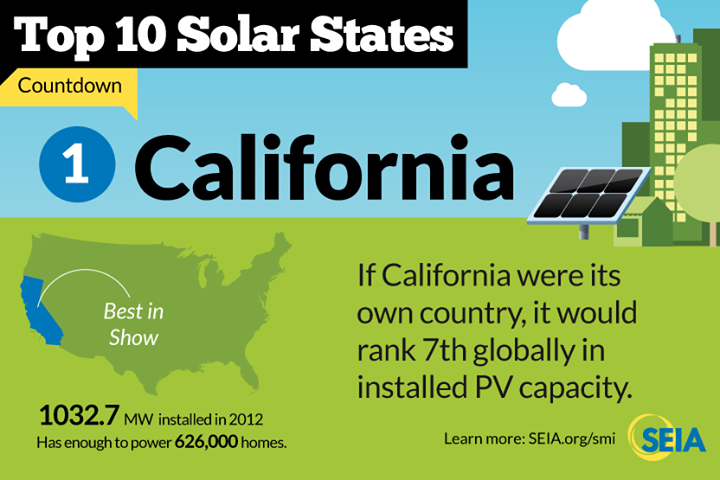 Indeed, it’s the #1 state in terms of total solar power capacity. But what solar incentives are available to homeowners or businesses who want to jump into the solar market? There are quite a few, so I’ll run down these in a rather concise way with links to more information. California Solar Initiative (CSI) Solar PV Rebates: Nearly used up, the residential solar PV portion of the CSI offers attractive rebates for solar PV projects installed in the state. A sister program is also in place for solar thermal systems and for solar on new homes. Despite the residential solar portion of the CSI being essentially used up, other state incentives combined with the now very low cost of solar power systems has kept residential solar in the state growing fast. Feed-in tariffs: As mandated by a state law, California’s investor-owned utilities and publicly-owned utilities have to develop and offer renewable energy feed-in tariffs for their customers totaling 750 MW of capacity (investor-owned utilities — 493.6 MW; publicly-owned utilities — 256.4 MW). If you’re not familiar with the policy, a feed-in tariff allows an electricity generator (including someone with solar PV panels on their home) a specified rate for the electricity they generate for a specified period of time, often 15 or 20 years. The rate should be high enough that it provides the owners of renewable energy projects with enough profit to stimulate the targeted amount of renewable energy growth. Notably, if a customer participates in a feed-in tariff program in California, they cannot participate in other state solar incentives. Here are details regarding feed-in tariffs in the LADWP district and in Marin County. Property Tax Exclusion: As simple as the name implies, certain types of solar systems can be excluded from property taxes through this policy. Most of those places also offer similar rebates for energy efficiency projects. You can check out the full list of rebates here. I know — all of that is a lot to navigate. Luckily, good and experienced solar installers in your area should have a firm grasp on what incentives you could and should apply for. Go through our quick and free system to get connected to an recommended solar installer in your area. Over 1,721 solar companies employing over 43,700 people are located across California. 1,045 megawatts of solar power capacity were installed in California in 2012, more than any other state. Over 3,761 megawatts of solar power capacity are now installed across California, more than any other state. There’s enough solar power installed in California to provide electricity for over 800,000 homes. California has more solar power capacity installed than all but 6 countries. There’s no doubt that California will continue to be a solar power leader for years to come. The only question is whether or not you will be a part of that. How much will solar save you in California? Find out in about 60 seconds!